Goodreads says, "Sixteen-year-old Mattie Gokey has big dreams but little hope of seeing them come true. Desperate for money, she takes a job at the Glenmore, where hotel guest Grace Brown entrusts her with the task of burning a secret bundle of letters. But when Grace's drowned body is fished from the lake, Mattie discovers that the letters could reveal the grim truth behind a murder. Set in 1906 against the backdrop of the murder that inspired Theodore Dreiser's An American Tragedy, Jennifer Donnelly's astonishing debut novel effortlessly weaves romance, history, and a murder mystery into something moving, and real, and wholly original." Mattie wants more for her life than just tending to her father's farm and taking care of her sisters. The year is 1906 and even though many women's goal is to get married and raise a family, Mattie has even higher hopes. She, along with her teacher, want her to go to college as she is incredibly smart; however, her father needs her at home to help with the family farm and is dead against it her going away. Their family's farm has been struggling since Mattie's brother left, so her father finally agrees to let her take a job at the Glenmore, a fancy hotel in town. While working there, a hotel guest named Grace asks her to burn secret letters for her. Not much later, Grace's body is found in the lake by the hotel and Mattie realizes that these letters might hold clues as to what was happened to Grace. A Northern Light by Jennifer Donnelly is so much more than a murder mystery. It's an evocative tale about family, love and following your dreams. I knew this book was going to be good; it's Printz honor book after all, but A Northern Light took me by surprise. I thought the main focus was going to be on a murder mystery, which was inspired by real life events. However, Maddie slowly but surely found her way into my heart. She's such a lovable character and her interest in words, books, friends, and family made her even more enjoyable. In A Northern Light, Mattie is torn between staying at the family farm or living her dream by going to college. The people who supports this dream is her teacher and her best friend, Weaver. She feels guilty wanting something more for her life, but she knows she is destined to be a writer. Her plans get a little jumbled when Royal Loomis, the town charmer, shows an interest in her and they start dating. Mattie thinks that perhaps staying at home might not be a bad idea after all? Donnelly brings the early 1900s to life so beautifully. I realized that I haven't read many books that take place on a farm and I found it to be fascinating. Between all of her chores, taking care of her younger siblings, working for her meddling aunt, and dealing with the town drama, A Northern Light was captivating. Before I read A Northern Light, I was already a huge fan of Donnelly's Revolution and her writing was just as incredible in this book. 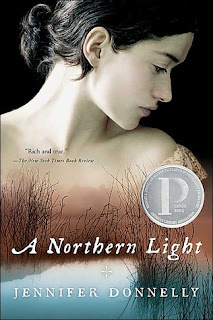 I adored the secondary characters in A Northern Light, especially Weaver. He was accepted to Columbia and is dying to get out of their little town. He seems to be always getting himself into trouble though; he has a bad temper. My heart went out to Weaver as he is African American and was targeted a lot by the ignorant townspeople. I was rooting for him from day one and loved his friendship with Mattie. Ultimately, the murder mystery and the letters that Grace left behind end up being meaningful to Mattie. The way the story unfolds is brilliant and Donnelly's use of flashback is spot on. I found myself thinking about Mattie's journey even when I wasn't reading the book. The cast of memorable characters, the rural setting and the time period make for such a unforgettable tale. I highly recommend A Northern Light, especially if you appreciate a fantastic historical read. I always hear beautiful things about Donnelly's writing, she is an amazing historical fiction writer, and I've always wanted to read her books but never got around to picking them up. I think I should start with this one since it's a Printz Honour book. I love that the character is such a huge part and the murder mystery doesn't take over the whole book. Thanks for the beautiful review, Christina! I would definitely start with this one. I also really enjoyed Revolution, too. I recommend that book as well. Thanks for visiting, Andrea! I really enjoyed A Northern Light, too! I think it's a fantastic YA historical, but also a delightful coming of age story wrapped up in a mystery. I haven't enjoyed Donnelly's adult historicals as much, unfortunately. And I haven't read Revolution. I hope she writes more! Mattie sounds like a fabulous protagonist! I think I have a copy of this book hiding somewhere in my room...I'll have to try finding it over the weekend! I just wrote out a comment but got an error message when I tried to submit, so not sure if it worked. I need to read this one soon as I loved Donnelly's 'Revolution' and I've had a copy of this for a long time - just haven't gotten around to reading it. Sorry if this is a duplicate comment! I read this in high school, and LOVED it. I'd still recommend it to anybody who listens. Great review!